A 2013 wedding season is winding down and the six months between May and October account for more than 60% of wedding ceremonies in the U.S. In the recent years, actually the last two decades, there have been little over 2 million wedding ceremonies performed in the U.S. per year. 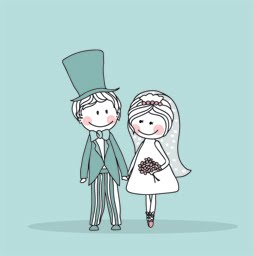 Besides the fact that you are now happily married, enjoying your honeymoon, and living together, there is one more significant change to your life that never comes to mind until around April of each year. From now on, the IRS looks at your income differently and your tax situation has changed. If your name has changed, contact a social security office to make sure that your social security number matches your name on your tax returns. File form SS-5, Application for a Social Security Card; you are required to show a legal proof of the recent name change. If you’ve moved, file Form 8822 that notifies the IRS of those changes. Communicate any changes to your employer to ensure correctly completed and timely delivered W-2 form. You may have to adjust your withholdings. Filing jointly and having greater income may bump you into a higher tax bracket so respond by adjusting your withholdings. Do that by completing a W-4 form and give it to your employer. If you are not sure to what level adjust the withholding, try the IRS withholding calculator. You can always file jointly or separately. Typically it’s more beneficial to file jointly but if you are really curious and have extra time, crunch the number for both scenarios and compare the results.